Recycled PET (polyethylene terephthalate) fiber made from recycled PET bottles. Environmentally-friendly fabric lanyards. Recycled PET (polyethylene terephthalate) fiber made from recycled PET bottles. Your choice of attachment. 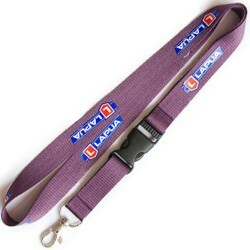 Lanyard colour can be matched to your pms colours.